Episode 24: Grief • Let’s talk about grief, bereavement, and mourning. Check out @heytiffanyroe on Instagram and Tiffanyroe.com for more. 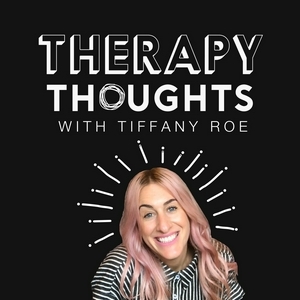 In this episode of Therapy Thoughts, we chat with Christy Harrison. This is a solid FAQ educational episode about Health At Every Size, Diet Culture, and Wellness Culture. Christy Harrison, MPH, RD, CDN is a registered dietitian nutritionist and certified intuitive eating counselor based in Brooklyn, NY. She offers online courses and private intuitive eating coaching to help people all over the world make peace with food and their bodies. Since 2013 Christy has hosted Food Psych, a podcast exploring people's relationships with food and paths to body acceptance. It is now one of iTunes’ top 100 health podcasts, reaching tens of thousands of listeners worldwide each week. Christy began her career in 2003 as a journalist covering food, nutrition, and health, and she's written for and edited major publications including Gourmet, The Food Network, Refinery29, Slate, BuzzFeed, Modernist Cuisine, Epicurious, and many more. As an expert on intuitive eating, Health at Every Size, and people's relationships with food, she's been quoted in top media outlets including The Washington Post, Self, Health, Refinery29, Men's Fitness, Bon Appetit, The Observer, and more. Her forthcoming book, Anti-Diet: Why Obsessing Over What You Eat Is Bad for Your Health, will be published by Little, Brown Spark in late 2019. Learn more about Christy and her work at christyharrison.com. In this episode I have the ultimate honor to sit and talk with Evelyn Tribole, co-author of Intuitive Eating A Revolutionary Program That Works. This was a dream come true as I've looked up to Evelyn as a mentor and thought leader since I read her book in 2006. In this episode we dive into Intuitive Eating! This interview is cut off at the 59:59 mark. The live interview was 1:00:53. In the final unrecorded minute, Evelyn directs you to follow her projects and goings-on on her website https://www.evelyntribole.com/ and on Instagram @EvelynTribole. Follow me for more on https://www.tiffanyroe.com/ and on Instagram @HeyTiffanyRoe Bio: Evelyn Tribole, MS, RD is an award-winning registered dietitian, with a nutrition counseling practice in Newport Beach, California. She has written nine books including the bestsellers Healthy Homestyle Cooking and Intuitive Eating (co-author). Her newest book is the Intuitive Eating Workbook: Ten Principles for Nourishing a Healthy Relationship with Food. Evelyn was the nutrition expert for Good Morning America, appearing from 1994-’95 and was a national spokesperson for the American Dietetic Association for 6 years. She was contributing editor for Shape magazine where her monthly column, Recipe Makeovers, appeared for 11 years. She is often sought by the media for her nutritional expertise and has appeared on hundreds of interviews, including: CNN, Today Show, MSNBC, Fox News, USA Today, Wall St. Journal and People magazine. As a speaker, Evelyn is passionate and has been called, “Wonderfully wise and funny”, whether providing a keynote or full-day workshop. Achievements and honors include, receiving the American Dietetic Association’s Award for Excellence in Private Practice. Many national magazines have rated Evelyn as one of the best nutritionists in the country including: Self, Harper’s Bazaar, and Redbook magazine. Professional memberships include: the Am. Dietetic Assoc., International Society for Study of Fatty Acids and Lipids, the Celiac Disease Foundation, and the Academy for Eating Disorders. Evelyn qualified for the Olympic Trials in the first ever women’s marathon in 1984. Although she no longer competes, Evelyn runs for fun and is an avid skier and hiker. She also enjoys surfing, kayaking and white water rafting. Evelyn’s favorite food is chocolate, when it can be savored slowly. Join me as I get to chat with Nicole McDermid (@theembodiedjourney). We dig deep, got uncomfortable, felt all the feels and spoke about privilege, social justice, feminism, fat activism, eating disorder recovery, & our work being intersectional. In this episode we talk about feminism, and in turn, empowerment, particularly as women in today’s world. We deep dive into aspects such as building agency, reclaiming autonomy, developing a connection with your body, body liberation, respect for your body and to stand unapologetically in your power. Bio: Nicole McDermid is a Social Worker, Counsellor and an Eating Disorder Recovery Coach, with over ten years experience working in the mental health field. Not only does Nicole practice in the clinical sphere, she is also a speaker and a fierce fat activist with a strong sense of social justice. She writes prolifically on issues such as weight stigma, size acceptance and eating disorder recovery across a number of different social media channels. In all facets of her work, Nicole practices from, and is informed by a Health at Every Size, Non-Diet, trauma informed and social justice framework. She also has a lived experience of an eating disorder, whilst living in a larger body and believes that we simply do not see enough representation of ALL people, in ALL bodies across the current eating disorder recovery narrative. Nicole is a visionary as both a clinician and an activist in the Eating Disorder sphere, drawing on both her professional expertise and lived experience to inform her practice. Nicole has had the recent honour of presenting at the Australia and New Zealand Academy for Eating Disorders in Melbourne, Australia on the issue of Weight Stigma in Eating Disorder treatment. This has been the pinnacle of Nicole's career thus far, and she hopes that this is the start of significant systemic shifts across this space. Episode 16: In this episode we talk all things Depression. We explored diagnostic criteria, treatment options, tools to help depression, suicide, genetic and environmental factors, and stigma. Grab my emotional regulation and mindfulness courses at MindfulCounselingSchool.com for the best depression management tools I've learned as a licensed counselor and psychology teacher! If you are in crisis call the national suicide prevention hotline at 1-800-273-8255 or Text GO to 741741 to chat with a trained Crisis Counselor 24/7 The Citizenry is offering you a $50 gift voucher toward your purchase of over $200! Go to CITIZENRYPODCAST.com/THERAPY today and use promo code THERAPY to redeem this special offer, just for podcast listeners. Visit LivingProof.com/THERAPY and use promo code THERAPY to get a free sample of their award-winning dry shampoo with your purchase. In this episode I share some tips for navigating postpartum body image concerns. For more, check out my body image course on MindfulCounselingSchool.com Make sure to visit todays sponsor at LivingProof.com/therapy and use the promo code "therapy" to score a free dry shampoo sample with any purchase! Tune in to episode 14 to learn about abnormal psychology, mental disorder, stigma, and what we can do to treat everyday like world mental health day! Visit MindfulCounselingSchool.com for in-depth classes and my instagram @MindfulCounseling for more! Episode 12: Caring what other people think. 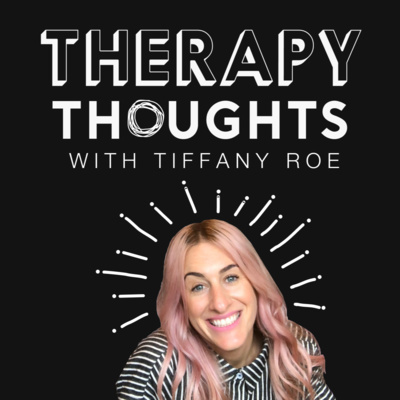 Tune in to hear about some theory behind Caring about others’ judgments of us, why relying on others love and approval for self-worth is tricky, and 3 steps to start working on this! Join me in traffic while we talk about boundaries! In episode 10 I share a little about my personal experience with an eating disorder and full recovery! I dive into eating disorder stigma, diet culture, and the 3 features of eating disorders. I share ideas on how you can talk to a loved one you may think has an eating disorder and a few general warning signs to look for. All things anxiety! Lets bust some stigma and get educated on anxiety. --> Follow me on instagram @mindfulcounseling & check out MindfulCounselingSchool.com for online educational courses. What's up with self-care? Why is it important, how do we navigate it, and get over the myth that self-care is selfish? As always, catch good tunes at the end. Therapy thoughts: body image! What it is, what it isn’t, and a guided visualization to start healing your body image. Love yourself. Understand why self-love is a crucial part of mental health and why it isn't selfish!